Wow, we’re nearly at the end of 2017. 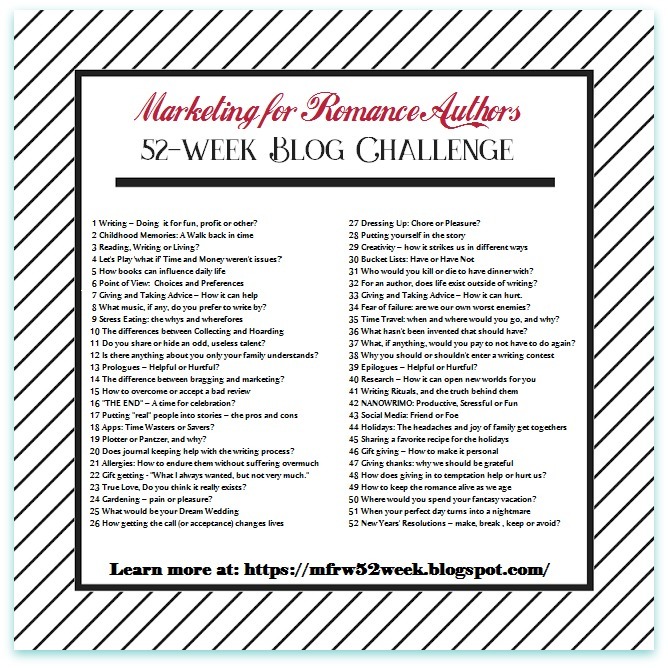 Congratulations to those of you who participated each week in the Marketing for Romance Writers 52-Week Blog Challenge. A goal is what I want to reach for–to strive to meet. In a resolution, I am saying I’m going to do it, and not falter with firm determination. There are too many obstacles that can get in my way with a resolution. Publish two books & rewrite another. Update backmatter in my older books. Get out and away from the computer. Dedicate more time to Reading for pleasure. Cook real food instead of food that goes DING. Let’s visit the other authors on our last week together in 2017. How about you, bloggers and readers? Do you make goals or resolutions? If so, have you thought of resolutions/ goals for the upcoming year? Thanks to all of you for taking a ride with me this year. Yeehaa! ← It’s that Joyous Time of the Year! Hi, Diana. Thanks for the reminder. Haha, I haven’t been away from the screen much, yet, but it’s only day 3, right? 🙂 Thanks for the New Year wishes. I’m wishing the same for you. Food that goes ding! I love that. Sounds like you have a good plan for 2018! Thanks, Alina. I got that phrase from a coworker and friend who didn’t cook. It fits though! Happy New Year! Those are great goals. LOL we both chose nearly the same image LOL! Thanks, Cathy. 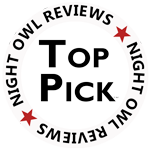 I saw a different version on another of our member blogs, too. Great minds think alike? Have a fabulous New Year. Those are wonderful and worthy goals, Mary. I believe you will reach all of them. Happy New Year, my friend. Thanks for that, Teagan. I got the jitters and removed two or three. Shrugging. LOL. Great list – good luck with them (especially with the writing goals and “foods that don’t go DING”, lol). Wishing you a happy, healthy, prosperous 2018! Thanks, Robin. I think I will need that good luck. I believe it’s time to prioritize. Wishing you all the best in the New Year. Best of luck with the upcoming marathon. You’re going to have a busy New Year, doing all these things. May your determination never falter. I’m already looking at that long list and sighing. great goals. loved cook real food. Want to come spend time in my kitchen? I also need to start really cooking again. Happy New Year. Thanks, Helen. The cooking part will be difficult for me. I’m so out of the habit of cooking that it becomes a chore now. 😦 Have a wonderful 2018! Great goals. Its a healthy list, but definitely doable. Have a happy, healthy and prolific new year. Thanks, Shari. I’m hoping the list is doable. 🙂 Happy New Year to you and your family. The cleaning doesn’t sound awful. I feel that way about my house. LOL Lots of pets and people so lots of cleaning. Your goals all sound reasonable and I wish you all the luck in 2018 on achieving them. Personally and professionally! A few of those goals sound like work! Ugh on the apartment cleaning, although that’s actually something I always have on my list. I wonder if I’ll ever be the type who enjoys cleaning…? Oh, who am I kidding? Anyway, wishing you all the best in 2018! I know what you mean. It’s always on my list, Sherry. It wasn’t always like this, but heck, there’s no one here to notice the dust… Wishing you a fabulous new year. Congratulations on making all the MFRW posts this year! Happy New Year back at ya, Maureen! Congratulations on making every topic this year.